The TowerRAID TR4M6GNC is a new 6G port multiplier solution for complete 6G solution. 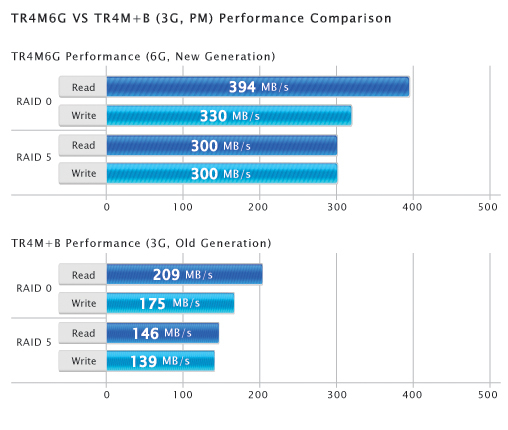 New generation of 6G TR4M6GNC provides nearly double the performance compare to older 3G generation. This compact JBOD tower utilizing the latest SATA 6G port multiplier technology, where one single eSATA cable connects to four SATA hard drives. Four hard drives can be access to the computer individually, providing instant storage expansion with ease. Designed with easy installation in mind, the trayless TR4M6GNC allows instant setup by simply inserting the hard drives after opening the protective ventilating cover. Port Multiplier technology is widely available in current eSATA port, including home sever, laptop and personal computer, and an optional port multiplier supported eSATA controller can be purchases for added performance and functionality, such as RAID application. TR4M6GNC supported in Windows, Linux and Mac, including storage expansion, home server applications as well as personal data backup. Note: SATA/eSATA port require support port multiplier in order for your computer to recognize multiple hard drive. Port multiplier supported eSATA port is required. Please see Sans Digital eSATA port multiplier controller card selections. Drive interface: 4 x 3.5" SATA, 6TB hard drives supported. Please see Sans Digital eSATA port multiplier controller card selections.